Arbor-Nomics® Turf Inc., a top-ranked Atlanta lawn care provider, has recently revamped its https://www.arbor-nomics.com site to better serve both existing customers and anyone shopping around for lawn care in Atlanta and surrounding areas. Along with a fresh new look, the site offers better navigation, updated content and convenient customer services, such as secure online bill pay. 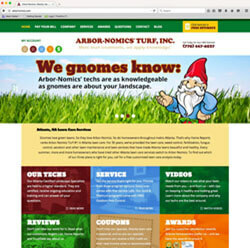 Visitors to the new site – which still features the beloved garden gnome, the company’s mascot – will find new content, including videos on problems and solutions for common problems in Atlanta lawns, ornamental trees and shrubs; seasonal special offers; and a customer portal, where current customers can view their lawn care history, pay their bills, and request services or ask questions. The site also offers information on the training and education that every Arbor-Nomics technician, or Certified Landscape Specialist, receives in order to treat Atlanta lawns, trees and shrubs knowledgeably and safely. Visitors can learn about the various programs and services the company offers and what the customer’s role is in achieving a great looking lawn and trees or shrubs.